According to IDC, PC sales fell 10 per cent in the Asia Pacific last year due to tough competition from smartphone and tablets. International Data Corporation (IDC) recent report stated that PC sales witnessed its first double digit decline and fell 10 percent in Asia Pacific region. PC's sales declined to 108 million units due to slow economic growth and tough competition from mobile devices, according to the report. "The economic sluggishness in big emerging markets in the region adversely affected buying sentiments," IDC said. "On the consumer side, smartphone and tablet distractions spread throughout the region this year, further contributing to the sharp decline in the PC market." IDC analyst Handoko Andi added that "2014 is expected to remain another challenging year for the PC market as competition will only grow among the devices." According to IDC, Chinese PC maker Lenovo with 24.9 percent of the market share retained its top spot, though sales fell 9.5% year-on-year due to a slump in its home market China. 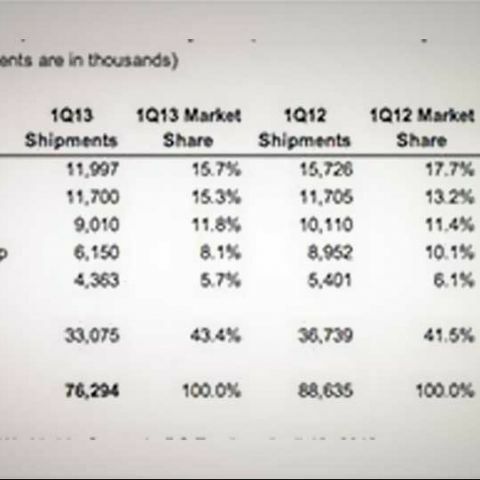 US firm HP has 10.5% of the market share, up from 8.9% from last year. The company sales rose mainly due to an education project in India. Dell gets the third spot with a 9.4% market share and the company's sales dipped nearly 2.8% on a weaker China market. Taiwan's Acer and ASUS have 8.1%and 6.9% of the market share, respectively, according to IDC. According to the report the sharpest decline in sales was seen in the Taiwan PC makers. Acer's sales fell an astonishing 28.6% as the company continued "to struggle with its product strategy," IDC said. Computer maker ASUS sales declined by 13.4%. According to the company's Worldwide Quarterly PC Tracker forecast in December last year, PC sales will see a further decline in 2014. The report added that the PC sales may stabilise in the long run but will remain around 300 million units. IDC added that consumer and commercial markets will both decline in 2014 and get a flat growth rate in the long term.